From the minute you set foot in this town there is one thing you can&apos;t help but notice, Austin is weird. Known not only for its eclectic residents, Austinites pride themselves on supporting locally owned businesses. And what better way to keep Austin weird than to celebrate the weirdness with the 13th annual Keep Austin Weird Fest & 5K! Keep Austin Weird Festival and 5K. Courtesy of Do512. Walk, cycle, bus, paddle board or carpool on down to the Long Center green on June 27 from 1:30 -10 p.m. and experience all of the quirkiness that Austin has to offer! The festival hosts live music, local eats and shops and tons of funky attractions like the Keep Austin Weird Sideshow. If this isn&apos;t enough to get you excited, $1 of every fest pass will go directly to support the Capital Area Food Bank. Entry fee to the festival is $12 for adults and free for children 12 and under. For those looking for more than a festival experience, join the hordes of other costumed weirdos for the Keep Austin Weird 5K! Show up on the Long Center green at 7 p.m. in your kookiest outfit and prepare to run the slowest 5K of your life, complete with 10 Fun Stops. Registration is $30 for adults and $15 for kids 12 and under and includes a commemorative T-shirt and race packet. For any other information regarding the festival or the 5K, you can check out their website. 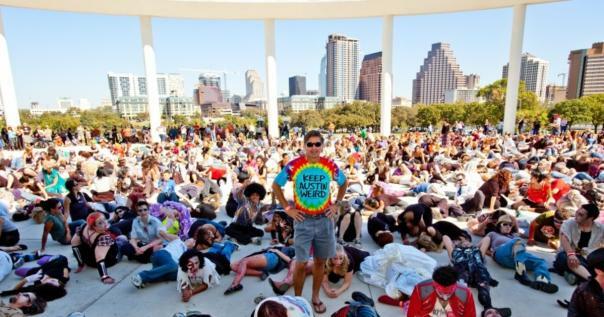 Keep Austin Weird Festival can also be contacted through e-mail info@keepaustinweirdfest.com or by phone 512-524-2953 ext. 1.